For some reason, the readers I meet often feel compelled to spill all their guilty literary secrets—to me. But readers, over the years I’ve learned that it feels much better and is way more fun to get those secrets out into the open. Eventually these anecdotes became the first chapter of my new book I’d Rather Be Reading. A couple weeks ago I shared this first chapter, and asked you to tell me your literary secrets, and WOW did you deliver. There were 361 blog comments alone, plus lots of Twitter and Instagram posts! Today I’m sharing some of my favorite, most relatable, and most hilarious responses. Thank you so much for sharing and I’d love to hear more of your confessions in comments. I checked my kids into the child center at the gym and sat on the couch to read. I’ve used my kids’ library cards to place holds ever since my library started charging for reservations for adult accounts. I use my kids library cards to reserve all of my books because kids can sit in the library and “read down” their (a.k.a. my) overdue fines. Lately I spend more time organizing my reading list than, you know, actually reading. Sometimes I think I like picking books more than reading books (gasp!). I was SO MAD at the ending of All the Light We Cannot See! I almost threw the book across the room. I hated Eleanor Oliphant Is Completely Fine. It’s sitting in a timeout on my counter thinking about how much it has annoyed me. Hating The Goldfinch isn’t a sin; loving it is. I read cheesy romance every now and then, but I NEVER record that on Goodreads!! I used to be addicted to Janet Evanovich’s Stephanie Plum series. Eventually, the novels got so repetitive that I stopped reading. But when a new one is published, I will read the last chapter in a bookstore to see if the love triangle has resolved yet. It hasn’t. I go to the thrift store and buy dozens of “trashy” Mormon romance novels and hide them under the bed. However, on my nightstand? The Ron Chernow biography of Ulysses S Grant. I’m 48 years old and I am always, as in 7 days a week, 365 days a year, reading one of the Harry Potter books. They relax me, help me sleep, and just make me happy. Whenever I’m reading a book that has a nice, good looking guy in it, I picture him as a young Kevin Costner. I wrote my best friend’s senior term theme on Jane Eyre for her OVER THE PHONE. I dictated what to write, and she still got an A.
I always tell people that The Thorn Birds is the longest book I’ve ever read. I never actually finished it. I’ve been known to read a book placed strategically in my open desk drawer at work when I just HAD to finish a chapter. This weekend when family was visiting from out of town, I went out to pick up bagels for breakfast. When I returned 30 minutes later, I told everyone there was a huge line, but I was actually sitting in the parking lot for 25 minutes listening to The Rules of Civility on Audible. When I say “Just let me finish this chapter,” I frequently read the next chapter, too. My husband is on to me, and will sometimes sit and wait to keep me honest. I got into a car accident and totaled the family vehicle because I was reading while driving. I’ve never told a soul. My husband still doesn’t know that’s why I wrecked our car! When I read a novel, I don’t read the very last page to see if it turns out okay (because I mainly read books that turn out happy, anyway), but I sometimes turn to the first page of the final chapter and scan for a character’s name. Alive and well? Okay! Because I can’t stand not to know what’s going to happen in the books I’m reading, I unashamedly turn to the ending to find out. When the fourth Twilight one came out, I bought it, but there was some weird printing error in the last 100 pages where it just skipped a bunch of pages. I drove to Barnes & Noble and just sat there and finished the rest of the novel…no regrets. I Google “does the dog die?” to make sure the dog doesn’t die in a movie or a book. When I was in middle school and high school, I used to always flip to the back and read the final sentence after I got done with the first chapter. I’m not sure what compelled me to commit this transgression against suspense. I dog ear books—library books, books I own, and unless you explicitly tell me not to, probably your books. I dog-ear pages all the time. I’m doing it right now. I literally collect bookmarks and my purse is full of train tickets, I don’t know why I’m still doing it. Oh God, I’ve done it again! I read books in the bath and get water droplets all over them. Including library books. Once I dropped a book I had asked the library to order for me in the bathtub. Whoops! When I’m on vacation I like to swim around the edge of the pool so I can spy on what everyone is reading! I think the Wikipedia plot summaries of anything by Charles Dickens are 98% better than the actual text. Why so many words, Charles? I have a very strong but probably unreasonable aversion to Jodi Picoult, as in, I will never even consider picking up one of her books. I’m suspicious of anyone who can crank out books so quickly. I feel SO guilty for saying this because I love my book club girls, but I can’t help but think that they don’t love reading quite enough. Thank you so much for sharing these confessions with us! They were a delight. And remember, whether you prefer Twilight to Oliver Twist, read one or 100 books per year, or even dislike Jane Austen, you are always welcome and appreciated here. P.S. 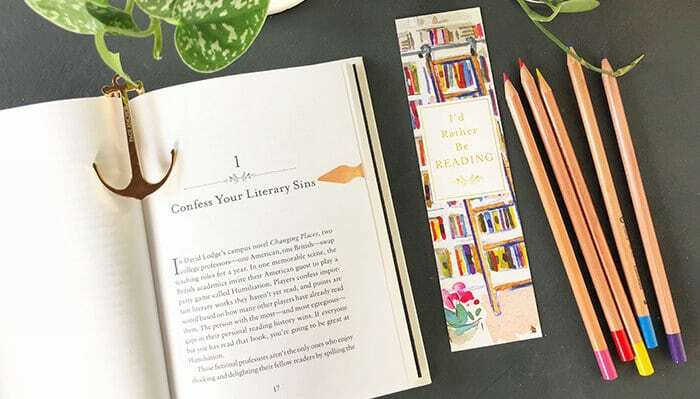 Click here to read or listen to the first chapter of I’d Rather Be Reading, called Confess Your Literary Sins. And remember, you still have one week to preorder I’d Rather Be Reading and claim the preorder bonuses. P.P.S. If you want to share your confessions in person, I’d love to see you on book tour! This is quite possibly the best blog post I’ve ever read… priceless confessions!! ? – If you like racy romances that are well written, check out Julia Quinn and Eloisa James. Both are highly educated (Eloisa is a Shakespearean professor at Fordham University and Julia graduated from Harvard) and write absolutely delightful romances. Sadly they still have the trashy covers – why?!? – I keep a book in my purse and books in my car so I can always grab one if I’m waiting in line or get delayed. Or delay my self by sitting in the parking lot reading. – If there’s a book I really want to read but the waitlist is super long, I’ll look to see if they have it in large print which never seems to have a waitlist. I feel guilty about this since I don’t actually have a vision impairment but my desire for immediate gratification seems to override the guilt. – I hate surprises. I almost always read the last few pages after I’ve read the first chapter. It allows me to actually enjoy the book because it reduces my anxiety. Same reason I love ruinedendings.com for movies. It’s only ruined if I sit in agony for 90 to 120 minutes wondering what’s going to happen. 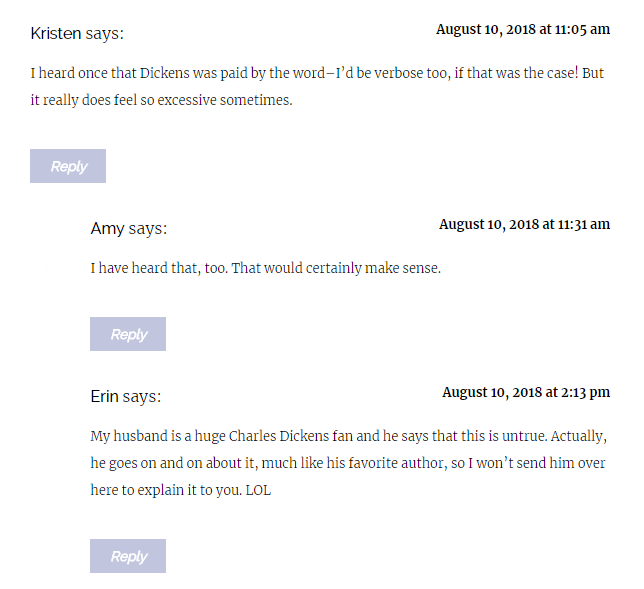 – Erin of the Charles Dickens-loving husband is hilarious and I think I’d like to be her friend. – Someone needs to read Educated because that book totally traumatized and enthralled me at the same time. That’s a character flaw of mine. If I’m traumatized or disturbed, I HAVE TO SHARE. Maybe it’s because I’m an extrovert? My book club is reading Educated this month but I was going to skip it bc this is a really busy month for me. But because of your comment I rush ordered it right now. Oh Aimee, that large print trick is going to be a game changer. And you should only feel bad if there’s an actual hold on it! Otherwise, you’re just freeing up more copies of the story for people who want to read it. Another library trick I learned by accident is that if you turn your Kindle on airplane mode, ebooks won’t return at the end of their loan period. My librarian best friend says she’s pretty sure it doesn’t even hold up the next person in line for that ebook, because the library system thinks it has been returned. I’ve been known to google “does X book have an ambiguous ending” and put it down if the answer is yes. I like to be surprised, but hate when authors lazily cop out of actually finishing their stories! Educated audiobook was phenomenal. If you liked that one, you might also want to try Escape and Triumph by Carolyn Jessop. Even more fundamentalist Mormon, even more dysfunctional family, also disturbing but ultimately hopeful. I eye-read Escape and ear-read Triumph. This is the best post ever! And I completely support the person who’s always reading Harry Potter. It’s comfort reading like nothing else! I can totally see how Harry Potter would be a wonderful escape for her! I hated The Grapes of Wrath. Hated it. It was required reading in high school so after the first few chapters, I read every 3rd page of every other chapter and that was enough to get me an A on the essay. There was a scene near the end of that book that has stuck with me all these years (I read it in high school and I’m 65) – it’s about a starving man and a nursing mama. I’ll never forget it. That is the most stand-out memory for me too, Susan. That scene is precisely why I never read another Steinbeck novel. Oh my, I am so glad I am not the only one! High school, too and it’s our 40th reunion year. Makes me really wonder WHY some books are considered classics?? Hemingway too. It is really nice to be old enough to pick what to read or not finish! What a fun list to start the week! I have recently started reading romance novels, and while I don’t have a problem with listing them on Goodreads, I refuse to buy the physical books, so that my husband and other guests don’t judge my shelves too much! Ebooks are much easier to hide! Also, I am totally on board with whoever said they read Harry Potter every day. My kind of people! I am so glad to know that I am not the only one reading and driving! I hate it when the light turns green and interrupts my reading! I was so upset after reading The Yearling when I was a kid- and I cried my eyes out over Where the Red Fern Grows as a child and as an adult. Why? Why do the animals have to die? And also, I’ve been so angry at John Steinback ever since reading Of Mice and Men that I’ve never read anything else by him. Oh me too. Can’t believe that my teens still have to read/suffer Of Mice and Men as part of the Australian English curriculum. 35 years after I did!! Oh, look at that: my confession made the list! hahahaha Loved it! Jodie Picoult is a Harvard graduate and she does great amounts of research for every book. I adore her books as they always are on current topics and have a message!!! Please read Nineteen Minutes EVERYONE!!! Nineteen Minutes tore my heart out. I sobbed. I will add, I’m not a crier. Not a movie crier, not a book crier, not a TV crier- so this is saying something. Oh my lands! 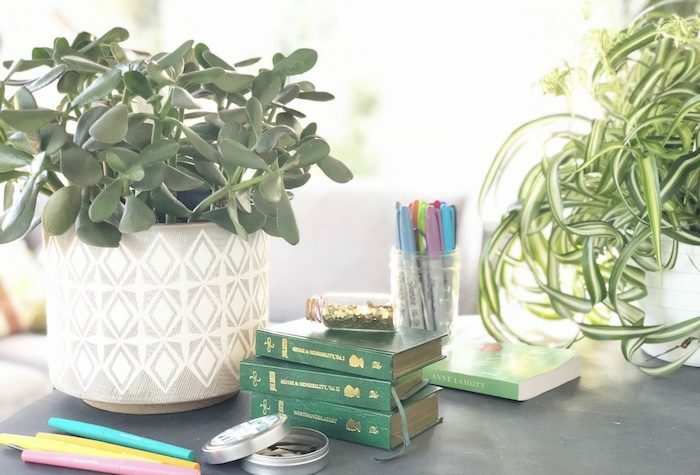 I just read the intro/first chapter you shared and then came right over and read this post: thanks for the belly laughs to start this Monday! I dislike the term “guilty pleasure” for reading. I have no guilt and will proudly call myself a romance reader with no problem counting those books on Goodreads…except when I binge and read more than 3 in a row. I don’t know if there is any author who divides readers more than Jodi Picoult. People who love her push her books on me all the time. I’ve read three and the adjectives I used to describe them sound very judgey so I’ll just say that they are not for me. Brandyn, I completely agree! I do always feel a little weird about posting more than a few romances in a row on Goodreads. I always try to throw in something a little more literary or non-fiction to break up the streaks! And it happens frequently because when I find a romance author I like I read the whole backlist. I do the same thing. I’ll record a couple then wait until I finish my audio book and record a couple more:) I started reading Courtney Milan last year and I think read like 9-10 straight. Yes! Same here, I discovered Sarah MacLean earlier this summer and read something like seven in a row. Whoops! That happened to me with Meredith Duran! I am late to this post, but I have to second Courtney Milan! Her books transcend the typical romance novel and are so addicting. Tessa Dare is my other favorite that I devoured last year. No shame in romance, the really good ones written in the last 5-6 years are incredibly feminist and the authors are intelligent and insightful women. I also have choice words for Jodi Picoult (and also Nicholas Sparks…shudder! )- but hey, you do you in your own personal taste. Where is this library that charges a fee to place books on hold?! That is horrific!! Is this a common thing? My library does that – $2 to place a book on hold. I assumed they do it to stop people placing books on hold, which takes them off the shelf for other people, then not picking them up. Let’s be honest – book lovers can be a bit over ambitious with the number of books we want to read! I’m sorry that is just ridiculous. Even if I’m not being overly ambitious, putting 1 book on hold a week is over $100/year and I read closer to 2-3 books per week. I’d probably cease to be a library patron. My library charges a $1 if you put something on hold and the hold expires without you picking it up (1 week). That takes care of people not picking up their holds. We also have a 40 book hold limit per account. It’s the library’s policy, not mine. Sorry that did come across kinda accusatory didn’t it:( Wasn’t my intent. Our library limits you to 6 holds per patron. There are no charges to place a hold. Phew! because I always have 6 holds at any current time. My library charges a 50 cent fine if you don’t pick up a book you’ve ordered. I’d go broke if they charged by requests. This makes me appreciate my library system (Harris County in Texas) even more. I think there is a limit to a number of holds, maybe 15 and if you don’t pick it up within a week, it goes back into circulation. No fees for holds. My problem this summer was that 4-6 books would come available at the same time and if I could only keep them for two weeks a few went back unread. Lol I can definitely relate to secretly reading at work and saying I’m going to read one more chapter and then reading two…or three. My husband has caught on as well and checks in every couple minutes now to make sure I haven’t started another. No one should ever be made to feel ashamed or guilty about reading romance novels. Ever. I think we really need to examine why we want to put down a genre for women, about women, written by women. There is a lot of top-quality romance writing (Alisha Rai, Courtney Milan, Tessa Dare, Beverly Jenkins, etcetera) that dare I say I have found more enjoyable and interesting that particular general best-sellers. For right now, Netflix does have the documentary, “Love Between the Covers,” that features both romance readers and romance writers being interviewed and also shows some parts of the industry itself. It is rather enjoyable to watch and I recommend it to anyone curious about romance novels. Tessa Dare is a diamond of the first water – I’ve read everything she’s written!! When I was in high school I had an after school job in the library shelving books (best job ever). I still feel guilty about how often I got distracted by the books and wasted time standing in the stacks reading. I would tell myself “I’m just going to look at the first couple of pages to see if I would like it.” Then, three chapters later I still wouldn’t have shelved the book. I was too genuinely embarrassed to confess my worst reading sin, but what the heck, confession is good for the soul, right?! For years I never read Harry Potter and actually felt a bit dismissive towards adults who did, thinking they were just kids books. Then I read them, got completely hooked, and was one of those people anxiously waiting for the release of the later ones. When the sixth book came out, it was released at midday on the day of one of my best friend’s birthday, and I deliberately missed her birthday celebration that night because I hadn’t finished reading the book!! I feel bad about that now, but at the time, I had no remorse ? Oh boy. I could have written at least half of these! I am so glad I am not the only one who looks at the last few pages of a book so as to calm down the suspense-factor. If I see the characters I love in these last pages, I know it’s going to turn out ok – well – at least I know they are alive! I just started The Great Alone and the sense of foreboding is so strong I’m not sure if I can finish. Re: Jodi Picoult – I shy away from her as well but the bright diamond (for me) in her collection is Small Great Things. I loved loved loved that one and recommend it! Thanks for a wonderful post today – I’ve loved reading everyone’s comments too! Val- I actually found the ending of The Great Alone to be the most hopeful part of the whole book, if that helps ? My confession also has to do with The Great Alone- I was the first person to checkout our library’s copy, but all I could get my hands on was the large print version. I didn’t want to put it down, and was attempting to bathe my children one handed, and dropped the book in!! It was a rippled mess when I turned it back in, but they didn’t say anything! Phew. These are great and hit very close to home – are you my long, lost twin?? Ditto to Stephanie Plum; I no longer read the series, but my husband got hooked on it and keeps me up to date re the love triangle. Double ditto to reading trashy romance, but not posting it on Goodreads. I have an image to maintain after all. Love all your blogs – this one was especially fun to read. Thank you. I read this post while in the bathroom (don’t judge me!). I was laughing out LOUD, and my husband knocked on the door and said “What’s going on in there??”!!!! Hahahaha!!! What a wonderful post! So good to know that others are as crazy about reading as I am! My confession is that I always have a book open while I dry my hair or put on my makeup. More than one library book has been returned with a suspicious stain from my foundation. Oops!! I still have tbr books on my bookcase signed by authors I saw years ago & yet I continue to buy more books & check out ones from the library. Recently 12 holds all came in at once/I’ve read 5 of them. This post was so much fun, and this community is hilarious! 1. I detest Wuthering Heights. 2. I did not read the Chronicles of Narnia, The Hobbit, Lord of the Rings, Dune, Ender’s Game, or Anne of Green Gables until I was an adult. 3. More than once I have wished I could erase my memory of every Jane Austen book and movie so that I could read/watch them again for the very first time. Great post! I relate to so many comments that I can’t list them all. Who knew Mormon romance was a thing! And for those who think their libraries are wrong about their fees: you should investigate their budgets, maybe that’s how they stay afloat. Go to a board meeting and tell them how you feel. I just finished Educated and loved it. I was saying to a friend that I must have a thing for highly dysfunctional families because I’ve read so many memoirs with that theme. Apparently, I’m not alone! I got a few chuckles out of these confessions. ? I am ridiculously excited that one of my comments made this post. My cats thought I had lost my mind over my celebration. I probably have! I relate to so many of these “sins”. What fun! – I hate reading Jane Austen books but I love movie versions of her books. The most I’ve read of any Austen book is about 1/8 of Emma. There’s something about her writing that I just can’t handle. – The highest writing grade I ever got in high school was on a paper about Wuthering Heights – and I didn’t even read half of the book. My teacher thought my paper was so well thought out, it proved that I didn’t just read the book; I identified with it in a way that gave me deep understanding of it. Nope, I hated it. Haha on Jane Austen – I’m with you! I have read so many re-tellings of Jane Austen stories but never the originals. I think I may be an expert on Pride and Prejudice without ever reading it! LOL! I read my first and last Jane Austen this year – Pride and Prejudice. It was fine. I was glad when it was over. Won’t be reading any more of her books. I’ll stick to the movies or the re-tellings, too. Glad I’m not alone! I have literally started and abandoned Pride and Prejudice six times. And the last time was so long ago, I can’t even remember why I ditched it. Now I feel like I should hide under my desk. I have always wondered why no one has mentioned Janet Evanovich and now I know why! She’s one of my favorite authors and although her books have gotten repetitive I still look forward to the new ones. They’re quick, easy, fun reads and I don’t have to think too hard about what is going on. Basically a good brain break between more intense books. Side note- to the person who left the comment I think that love triangle will never end. I keep reading them too, sometimes one will still be exactly what you’re looking for, sometimes not. I get at last one laugh out loud moment every time and that’s hard to come by in books. A lovely, heartwarming post that had me laughing out loud. You are my people! Thanks All! Our public library used to charge 25 cents to put a book on hold. A small price, literally, considering what gas costs these days. It was always a bargain to me to spend that quarter. Recently I walked into the library clutching my 75 cents for three holds I was picking up. The branch manager told me they had just started waiving the fee that week. I was absurdly happy and grateful! I’m not a mother, but I am totally on board with this. I’m actually kind of surprised that there are mothers who nurse and DON’T do this, TBH. It seems like perfect reading/podcasting time, and no one’s allowed to judge. These confessions have me HOWLING, thank you so much for sharing!!!!! My favourite has to be “my mom likes murder” = literal LOL (probably because I’ve just started binge-listening to the My Favorite Murder podcast so I can totally relate). 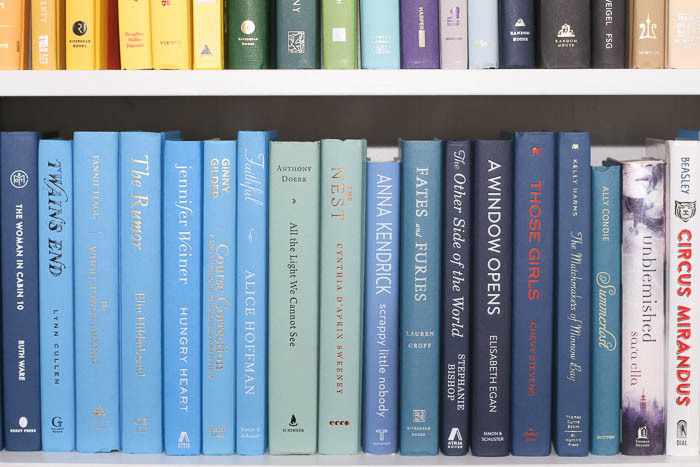 I feel like my whole blog is a literary confession (because I’m reading and reviewing all the classic and contemporary books that I “should” have read already – The Hunger Games, Pride and Prejudice, etc.) BUT my real confession would have to be that I am almost always faking my enthusiasm about people’s book recommendations. ESPECIALLY if I just met them. Like, I have enough books on my TBR, and you barely know me, why are you trying to force your favourite book to the front of the queue? SAME! Like, unless 5 or more people recommend a new book to me, it’s not being added to my already never-ending list! THANK GOD it’s not just me!! I had this sneaking suspicion that I was just super rude ??? I LOVE these confessions! And I 100% relate to the one about Where the Red Fern Grows. I read it because it was worth a bunch of Accelerated Reader points, but when I finished it, I threw it across the room and went and sat on my mom’s lap and sobbed for hours. I was ten and I still haven’t gotten over that infuriating book. This is hilarious! I knew I loved this blog. These were so fun to read! Here’s mine: I frequently read while eating so I’m constantly getttint sauce and other food stains my library books. My librarian hasn’t picked up on it yet thankfully. A related confession: since I frequently read while eating, I often eat more than I should just so I can justify reading a little longer. If the book is really good, I find myself going back to find more food to eat so I can finish one more chapter. I loved the confession of hating books. It rarely happens to me that I actually hate a book. One memorable exception was Racing in the Rain. I hated it the first time. I repressed the title and a year later, when friends were raving about it, I bought the book while on a trip and read a quarter of it before I realized what it was. I left it in the motel wastebasket! I confess, I left my childless brother babysitting my 5 and 8-year old children one evening. I suggested he let them watch the dvd of Where The Red Fern Grows, which neither they nor he had ever seen or read. Upon my return his first words were, “Don’t ever leave me with a movie where the dogs die to show to my niece and nephew again!” He still, 30 years later, brings it up now and then.